Didinium ingests Paramecium. Note that Paramecium is folded in half as it is compressed and enters the waiting food vacuole. This micrograph also shows a few discharged Paramecium trichocysts as well as the metachronous waves of cilia in the two characteristic ciliary girdles of Didinium nasutum. This micrograph was taken in 1968 by G. Antipa on a Cambridge Mark IIA operating at 20kV. The negative magnification is 500X. Further details are available at Wessenberg, H. and Antipa, G. 1970. 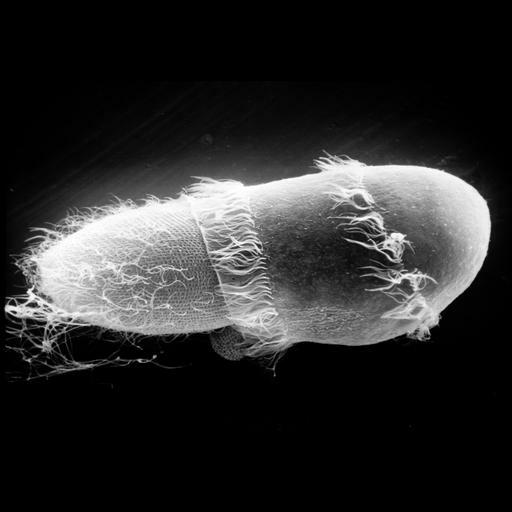 Capture and ingestion of Paramecium by Didinium nasutum. J. Protozool. 17:250-270.